In the movie Up in the Air (read my review here), George Clooney’s character, Ryan Bingham, repeatedly gives a speech about how it’s better to travel light through life. If you put all your belongings in a backpack and set it on fire, you’d be free. It’s easy to see why Bingham believes this since he’s constantly avoiding putting down roots and making meaningful connections. I’ll admit I lived that way for years and found it liberating. As a kid, I left everything behind in Viet Nam to come to the States. Dogs, relatives, friends, shoes, books—my backpack was literally empty. But instead of refilling it as soon as I could, I left it bare. I’d learned I could survive on very little so why get attached to things again? (This didn’t apply to people, just objects.) When it came to spartan living, Jack Reacher and Joe Pike had nothin’ on me. Then I got to my books. Could I live without them? What did they mean to me? And that’s when it hit me some weren’t just books, they’re snapshots of specific moments in my life. I could look at one and remember exactly where I was, what I was doing and how I felt while reading it. When I was traveling by myself a lot for work one summer, a set of Harlan Coben paperbacks kept me sane by making me laugh through 10-hour flight delays and sleep deprivation. Joan Aiken’s Nightbirds on Nantucket makes me instantly think of my friend Maria Taylor from 7th grade, who introduced me to the Wolves Chronicles featuring Dido Twite, a plucky girl whom I desperately wanted to be when I was young. Maria moved away after 7th grade but every time I look at Nightbirds on my shelf, I remember her. Mary Higgins Clark’s While My Pretty One Sleeps reminds me of standing in line in frigid weather back in 1985 to meet the author for my virgin signing experience. I was so excited, you would’ve thought I sighted Elvis. And that first successful foray encouraged me to attend other author signings, resulting in many autographed books by my favorite writers. 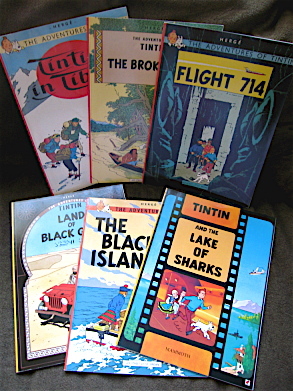 My Tintin books are the first things I remember being able to read on my own (though I read them in Vietnamese), and the first time I became obsessed with a series as a child, wanting to collect every adventure. A.A. Milne’s Winnie the Pooh books have lifted me through difficult times because that bear of very little brain is actually very wise. My copy of The Red Balloon takes me back to the time in fourth grade when I fell in love with Albert Lamorisse’s classic film Le Ballon Rouge because I didn’t need to speak English in order to grasp its wordless beauty. So, my question to you is: What are the books on your shelves snapshots of? What specific memories do they represent? While I await your stories, I guess I won’t be lighting my backpack on fire after all. It’s uncharacteristic of me to be serious, but…….I fell into a deep, dark hole of depression during my 4th year of living in NYC and the only thing that helped me climb out is now a very tattered paperback called CHOP WOOD, CARRY WATER. ….and Orson Scott Card’s SEVENTH SON. Thanks for sharing. I’m glad you’re better now. I love how books can not only entertain, educate and inspire, but also heal. Tell me about it, PCN! There’s a nice quote (or paragraph) in Cornelia Funke’s Inkblood which deals exactly on that: how books become “heavier” with memories, and exactly how, whenever you reread them, you find yourself younger and different “as a pressed flower” amongst the pages. I find my 13-year-old self in Sienkiewicz’s Quo Vadis; a confused and very geeky teen in The Lord of the Rings; and my elementary school is somewhere in Jules Verne’s work. My elementary school best friend and I were suckers for Sherlock Holmes stories, and we played we were Holmes and Watson during recess – he, being taller and slimmer was Sherlock and ended up majoring in Law… and I, a.k.a. Watson, almost went to Med School (but became a Food Technologist instead). Thanks PCN. You always find a way to make me smile! Like Shell, I love that quote. My books are indeed heavy with memories. If you don’t mind my asking—what’s a food technologist? Sounds intriguing, mostly because it involves food. Another poignant and thought provoking post, PCN. And I love that quote of Poncho’s from Cornelia Funke’s Inkblood. I don’t tend to re-read fiction, but some books have stoically remained on my shelves in spite of my regular de-clutterings, and I guess it’s due to their fingerprints on my timeline. I remember at the age of fifteen struggling and failing through the first hundred pages of Lord of the Rings several times, until an overseas trip involving numerous departure lounges and bus tours finally got me over the line and into a world I then had to drag myself away from. The poor old paperback is falling apart, but I don’t want a new one. I just want that one. I’d have a hard time not slipping it out of the backpack before striking the match! I know what you mean about wanting a particular copy of something. I managed to replace my Tintin books but I still long for the ones translated into Vietnamese that I read as a child. I hate the finality of it, having to accept I’ll never see them again. I have the Calvin and Hobbes complete collection to keep me from losing it. They remind me of a simpler time when I took for granted being a kid. I got older, moved out of the house and went off to college and beyond, then I realized that mom won’t be making me grilled cheese sandwiches any more and those character building chores of Dad’s were supposed to help me survive in the big bad world of adulthood. Ohhhhh, Calvin & Hobbes. I don’t have enough words to describe how much I love and miss them. Not only do have the complete set of books, a friend framed the last strip for me and it hangs in my living room as one of my favorite gifts ever. My first year in college I was miserably homesick with the pyscho roommate from hell. I desperately wanted my parents to let me leave and go home…attend the community college close, but they said absolutely not. I had to stick out the year. I was at Kent State, which is the third largest school in Ohio, so most of my classes were huge and impersonal. However, my English course was an honors course and it was only about a dozen students. That semester, ironically, Dante’s THE INFERNO and Kesey’s ONE FLEW OVER THE CUCKOO’S NEST made me fall madly in love with literature – even more than I already was – and they got me through that year. The next year I transferred to Baldwin-Wallace, which was much smaller and I ended up getting a degree in English Lit. I also have a soft spot in my heart for THE MONKEY’S RAINCOAT, which really hooked me on crime fiction. I had read Patterson and Grisham and Cornwell before but they didn’t leave me desperate to find more crime fiction. THE MONKEY’S RAINCOAT totally did! And finally I have to mention the audio of THE DARK HORSE by Craig Johnson. I listened to that driving to my first Murder & Mayhem in Muskego. All of those audios stick with me because they have brought such pleasure to my driving experiences – I typically hate to drive, but while listening to George Guidall read Craig Johnson, no one’s stupidity bothers me then! So many books have left me with wonderful memories, even if I just read the whole thing sitting in my living room. They are so amazing! Sounds like you’ve had vivid relationships with your books and have gone through a lot with them, Jen. I’m glad Monkey’s Raincoat made you a full-fledged card-carrying member of the crime fiction community. I very much enjoyed reading about your experiences in this post, PCN. It’s something quite special to take in how the books in your life were crystalized to a specific time and place, and held in memory. This was a magnificent and very personal post. Thanks for this. Thanks very much, lp13, for reading and your kind words.